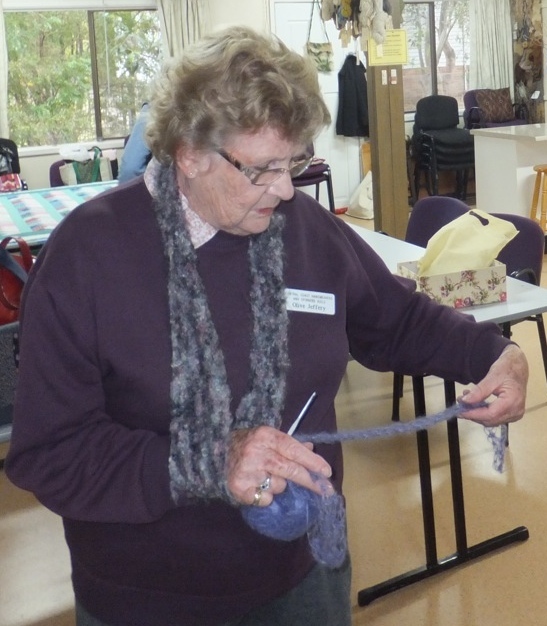 Jane, Beth and Noelene all produced their very own felted piece. As you can see they looked happy with the job. An easy and great day had by all. By Lyn. Our Wednesday night group have been very busy making a sign for the cottage. They felted a multitude of different coloured squares and then put contrasting letters on each one to make a very long sign that runs the full length of the room. It really brightens up the place. Thank you ladies for all your hard work. by Naomi. 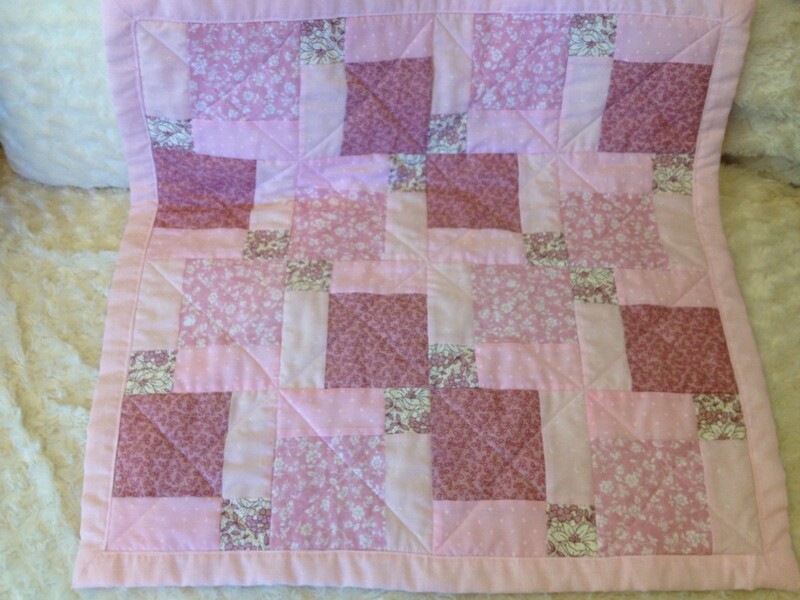 Pink Disappearing Nine Patch – This makes use of five fabrics to complete the 9 patch design, before it is cut into 4 equal pieces and each of the pieces is turned 90 degrees. 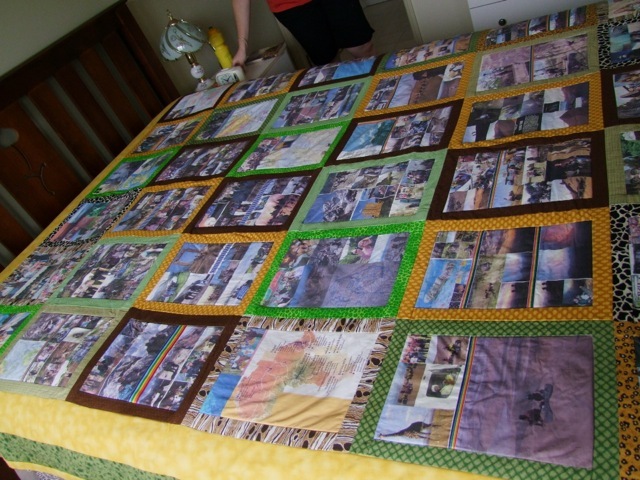 The binding and the back of the quilt use a sixth piece of fabric. By Linda. 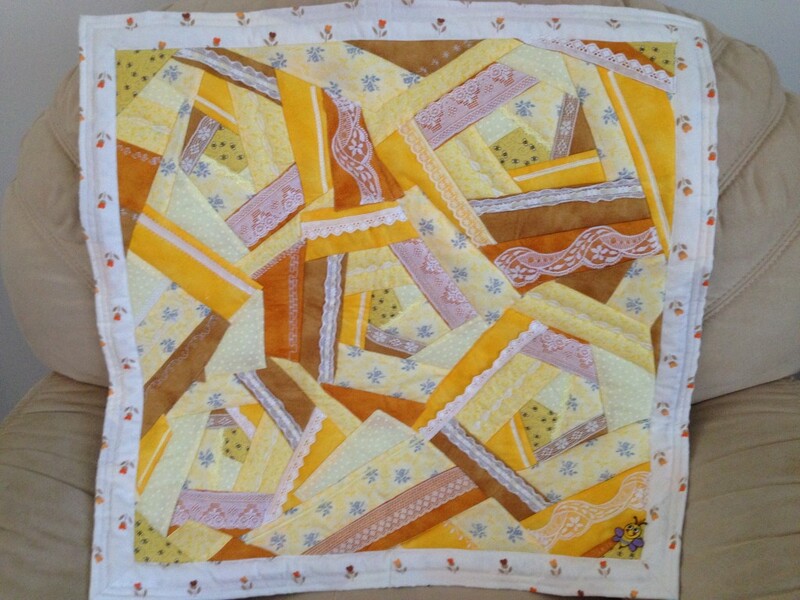 Crazy Quilt – This quilt has five central irregular pentagram shapes which are stitched down. 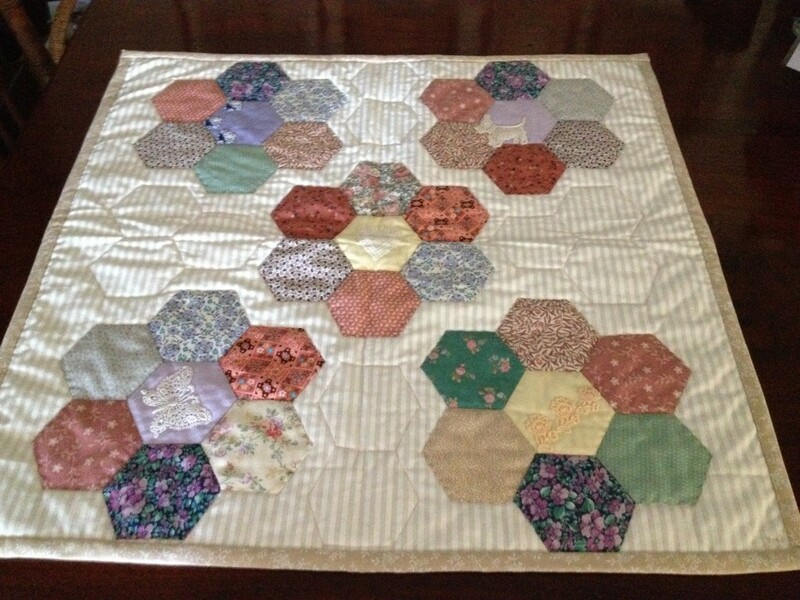 The crazy quilting is done on each of the five central blocks simultaneously until one runs into another. The fabric choices are autumn colours, using a variety of lace, ribbons and fancy stitching from the sewing machine repertoire to embellish. 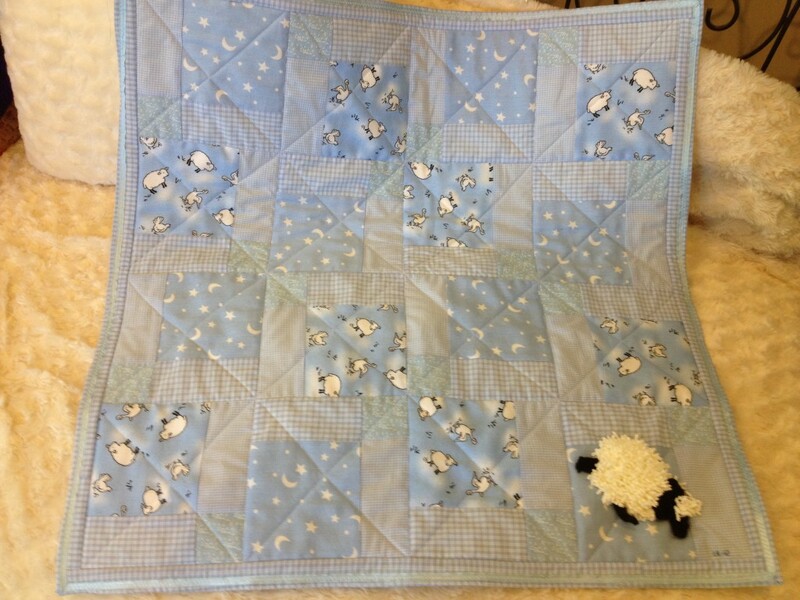 The binding and back of the quilt use the same fabric. 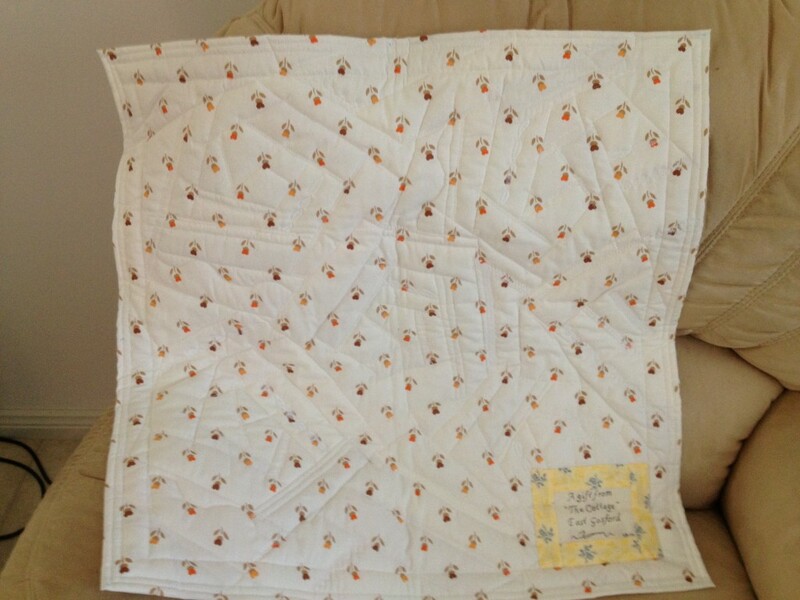 This is a quilt as you go piece. 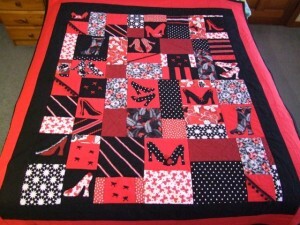 The picture of the back of this quilt clearly shows the crazy quilting. By Linda. 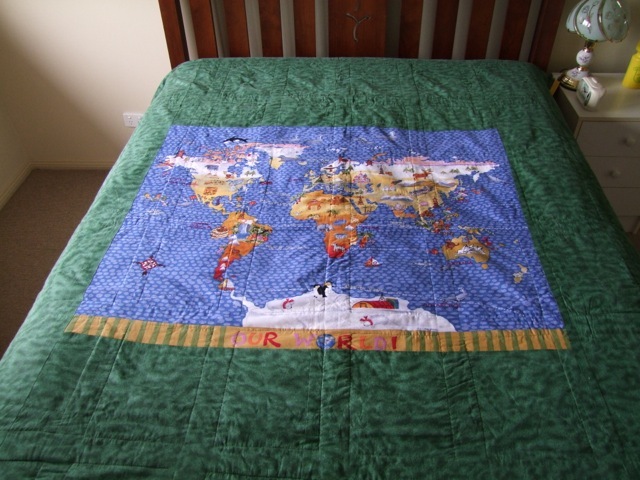 This quilt was done by Lyn for her daughter Tania, illustrating her world travels. all the memories and so very easy to work with. By Lyn. Water is the life-blood of this arid country of ours. I have used layered mesh, free-form knitted textile, and machine and hand stitched applique to express the richness and complexity of our waterways. By Jenni M.